The outdoor advertising industry is a formidable force in Los Angeles and other cities throughout California and the rest of the country. With a deep-pocketed membership it can pour millions into lobbying for favorable laws and ordinances, and it can mount lavish public relations campaigns on behalf of its view that billboards and other forms of outdoor advertising are necessary and highly beneficial elements of our visual environment. With such resources, it’s a little curious that representatives of this industry so often resort to distorting facts and circulating disinformation. At a local level, consider this week’s meeting of the City Council’s PLUM Committee which took up the question of what to do with digital billboards erected by Clear Channel and CBS Outdoor pursuant to a lawsuit settlement that a superior court judge ruled unlawful. Greg McGrath, head of Clear Channel Outdoor’s Los Angeles division, spoke against revoking the billboard permits, saying that doing so would be grossly unfair to a company that has operated in L.A. for “almost a century.” Since Clear Channel was founded in 1972 in San Antonio, Texas, and didn’t enter the L.A. market until 1997 when it bought out another billboard company, the statement would seem a definite stretch of the truth, even if previous buyouts by other companies can be traced back to one that first put up billboards in L.A. in 1918. The report listed addresses of 28 billboards that CBS Outdoor had removed up to that date. However, records showed that no permits were on file for 15 of those billboards. So does Brooks’s assertion that all billboards the company took down were legally permitted qualify as a whopper? And to what purpose? To show that CBS Outdoor deserves to be on the honor roll of the city’s best corporate citizens, when in fact it took advantage of the fine print of an agreement sold to a sleeping city council by an ethically-challenged city attorney? Disinformation also found its way into the PLUM committee meeting room. Laura Toncheff, Clear Channel general counsel, used her minute at the speaker’s stand to claim that hostility to digital billboards was a “minority view” and cited a recent Arbitron survey that allegedly proves it. What she didn’t say, and what billboard industry lobbyists and others never say when they cite such surveys and polls, is that it was commissioned by the outdoor advertising industry; specifically, the Outdoor Advertising Association of America (OAAA). As for that Arbitron survey of 401 Los Angeles County residents during last year’s Christmas holiday, a close look at its methodology and detailed numbers lead to the inescapable conclusion that it proved absolutely nothing except that drawing conclusions from a scientifically-unsound, biased study is the kind of fool’s game the outdoor advertising industry wants the public to play. More disturbing is the repeated trumpeting by the industry of OAAA-sponsored studies purporting to show that digital billboards have no negative effects on traffic safety. Borrowing a page from the tobacco industry which insisted for years that its products were harmless, the outdoor advertising industry willfully disregards questions that have been raised numerous times about the potential for digital billboards to distract drivers and therefore increase the possibility of accidents. The most recent questions and concerns were raised in an independent study commissioned by the American Association of State Highway and Transportation Officials. And the Federal Highway Administration is conducting a rigorous, scientific study of the effects of digital signage on driver distraction and consequent unsafe driving. But you’d never know this by listening to people representing billboard companies, sign manufacturers, and others with a big financial stake in filling our public spaces with those brilliantly-lighted, rapidly changing advertisements. Finally, the industry has cranked up their promotion machine to maximum volume in touting the use of digital billboards to broadcast public safety messages, including the faces of suspects and victims in such heinous crimes as child abduction. Here, the central issue isn’t disinformation-although there is some—but the cynical exploitation of tragic events to break down resistance to a product that represents a huge intrusion upon our shared public space. There are no independent data showing the effect, potential or otherwise, that digital billboards might have on the arrest and conviction of lawbreakers beyond an anecdote here and there, or how they might help people cope with a natural disaster like an earthquake, when electrical power would likely be interrupted. In Los Angeles, there isn’t any requirement that Clear Channel or CBS Outdoor broadcast public service announcements, and if there were such a requirement shouldn’t it also extend to TV, cell phone screens, and monitors of computers connected to the internet? At any given moment, that would probably reach far more people than the digital billboards that are distributed through the city in a highly uneven manner. The next time you’re on a drive down a commercial street that has lots of billboards, notice what’s being advertised. Fast food, liquor, movies and TV shows with violent themes. 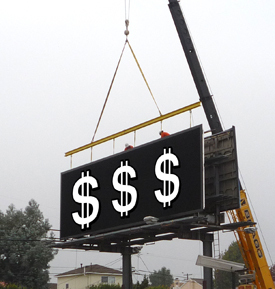 Could the real public service by billboard companies be to start declining those ads?